Coronary artery bypass grafting (CABG) is a type of heart surgery for patients with severe coronary heart disease (CHD), a leading cause of death in Western countries. The disease is characterized by gradual build-up of fatty and calcium deposits (plaque) within the arteries that supply blood to the heart. This reduces the amount of blood flow to the heart, causing chest pain, or if the arteries are blocked completely, causing a heart attack. The aims of CABG surgery are to reduce symptoms, reduce the risk of heart attack and improve survival. CABG is a technique that involves using an artery or vein from elsewhere in the body to bypass the blocked vessels, restoring adequate blood flow to the heart. The artery or vein is attached around the blockage, so that there is a new pathway for oxygenated blood to reach the heart muscle. There are several different types of CABG surgery: conventional, “off-pump” and minimally invasive CABG. All of these operations are long and not without significant risks. All require a general anesthetic, and necessitate a significant period of recovery after surgery. Conventional CABG involves opening up the sternum to access the heart, using drugs to stop the heart pumping, and connecting a cardio-pulmonary bypass (CPB) machine to maintain oxygenated blood flow to the body during surgery. Arteries from within the chest wall, the arm, or veins from the leg, are then harvested. These conduits are grafted to bypass the blockages in the native heart vessels. Once blood flow is restored to the heart, chest drains are inserted to drain fluid and the chest bone is closed up using wires. Off-pump CABG is performed in a similar manner, but without stopping the heart beating. Traditional and offpump CABG are equally viable options, with no difference in results. Minimally invasive CABG is a relatively new technique which accesses the heart through several small incisions. While there are several benefits, this procedure is not suitable for all patients. CABG is usually reserved for patients with symptoms of heart disease and who are at risk of heart attack. It is not the only available treatment option for CHD: medications, lifestyle changes and less invasive procedures such as angioplasty or stents may also be suitable, depending on patient characteristics. 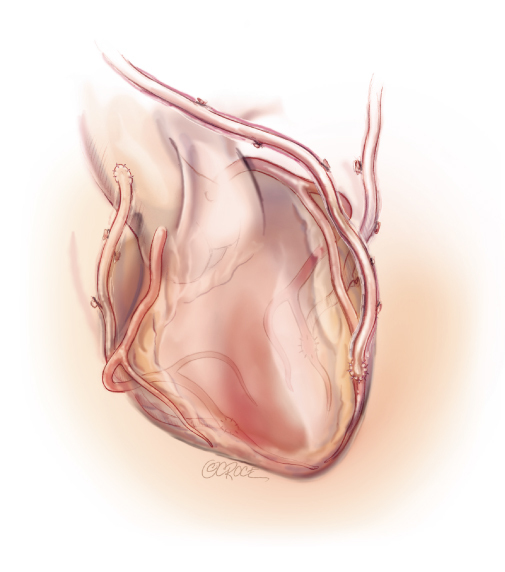 CABG may be recommended if patients have disease involving multiple coronary arteries, or involving the left anterior descending artery, or if these other treatments have not worked or are not feasible. The outcomes of CABG are excellent. Most patients remain free of symptoms for up to 15 years following surgery. The surgery also reduces the risk of heart attack and improves survival.